And what would you say no to? Would you take that meeting? Would you continue to nurture that relationship or let it go? I decided that even though I was not near that goal at the time, I would act as if I was. I decided to be ‘that', whether I had achieved it or not. This was less a social experiment and more a decision based on living a life by design, not default. It came after observing the way people were going out at night pretending they were networking and then proclaiming to want to spend more time with their kids. This was … a decision based on living a life by design, not default. Lex and the kids are my first priority, my health is second, and committing to the committed became my filter for how I would invest the rest of my time. That, and being on my boat floating ideas around. As a result, I don't network to get ahead; I connect to inspire and be inspired. I rarely say yes to coffee catch ups and joint ventures. I don't respond to fast media requests for comment. And a meeting I do attend that doesn't progress something or advance a wildly important goal feels like a kind of robbery. I'll never get that 30 minutes back again. If I am not with Lex and the kids then we better be doing something truly worthy of the time. It's got a certain ruthless quality to it and it no doubt offends or hurts many people in my life. Any offence is not intentional; I simply don't want to waste a minute doing something that is not something I choose fully. Lorna Patten, one of my coaches, once explained this as self-referring as opposed to self-centred — nice distinction. I don't network to get ahead; I connect to inspire and be inspired. I really appreciate you reaching out and trying to find a time to meet. Professionally, I am super focussed right now on three things: the Thought Leaders Business School, my latest book and my Conference Keynote business. I also made a choice a few years back that I would try to have it all. Family, loving relationships, deep friendships and a successful business. For this to all happen my schedule has become very compressed. I am not taking on any new projects at this stage as I strive to deliver on my work life integration. So I am making sure that any meetings I do have are super productive and beneficial for all parties involved. If, knowing this, you still want to meet then let’s clarify what we can achieve together before we get together. My business manager Sarah is the perfect person to discuss all this with, and I have CC'd her in on our conversation. I get that this means I can't be all things to all people, but for this little duck it's the key to focus and achieving everything I can in this busy time of life. Thanks again for making a connection and reaching out. Does this mean I'll miss an opportunity here or there? Absolutely, but FOMO (fear of missing out) is a concept born of lack, a scarcity idea, and one that distracts you from what you really want. If you are truly at choice, what do you choose? I choose to commit to the committed. Not just those who share my blood, not just those who are in my orbit, but those who turn up to put something into life, to make a difference, shake the tree, reject the status quo. For me, that group is thought leaders — people who dare to stick their head up, have an opinion and stand for something. What do you choose? Who do you choose? I choose to commit to those who turn up to put something into life, to make a difference, shake the tree, reject the status quo. So many procrastinators will hope a relationship with you gets their job done or their goal achieved. Don't spend time with them, it doesn't help them if you do their homework. People join gyms, go to self-help seminars, and buy books without turning up to exercise, applying an idea or turning a page. Interested is not committed. I have learnt from years of running leadership and personal development programs that for some people, investing in the course is the commitment. It's like joining a gym but never actually turning up to train. The real commitment is not the payment or enrolment in a program, it's doing the work. When the going gets tough (and it always does), some people enrol in a new course, hopping from one program to the next. This chart shows you the pattern. This video by Scott Belsky, founder of Behance and author of Making Ideas Happen, walks you through this idea from a creativity perspective. It's never about the money, but money is a good start. Money is the lowest form of commitment. Doing the work is what we need to stay focused on if we want to reap the rewards of our investment . 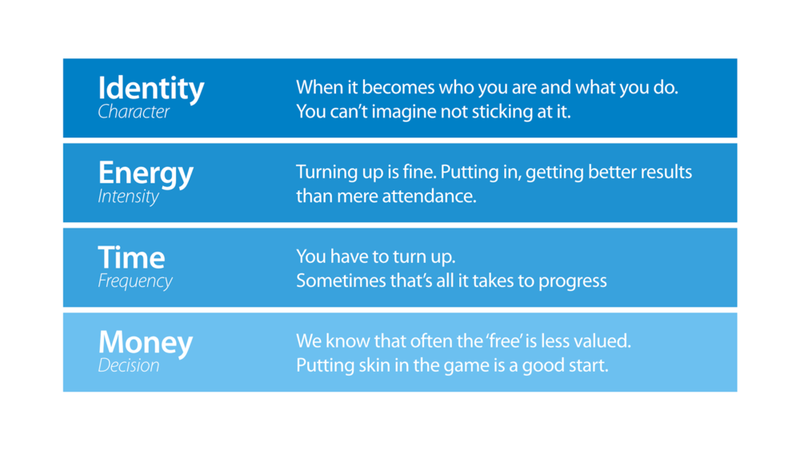 The commitment ladder has money at the bottom, time next, then energy (the last two being the work), and finally identity. Thought Leaders Business School helps experts improve the financial performance of their consulting practice. Occasionally a student gets through the enrolment process with a 'this will fix it for me' mindset when in reality only they can do the work required. You simply can't buy the result, you need to do the work. You can't outsource commitment. So if you did not have to work, what would you do differently? This question is sneaky because it's less about work and retirement or financial independence and more about life on your terms. It’s what my business partner Pete calls a 'life without compromise’. Be clear on what you say no to, that way you have the capacity for the things you want to say yes to. It's a place where you can begin to live a life by design, not default. Get good at saying no. Commit carefully and less often. Don't do other’s work for them. It's disempowering for them and builds resentment in you. Don't try to please everyone. Just accept that some will and some won't. And that what they think of you is none of your business. Obsess about leverage. Resist the status quo. There is always the possibility that there is a faster, smarter or better way to do things than how it's been done to date. Get really clear about what matters most to you. You only have X summers ahead of you, don't waste them in obligation, desperation or compromise. We don't say no for a bunch of reasons, but really for me I say no to the things that don't align so that I can say yes to what matters. Make this the week of no and see what happens. 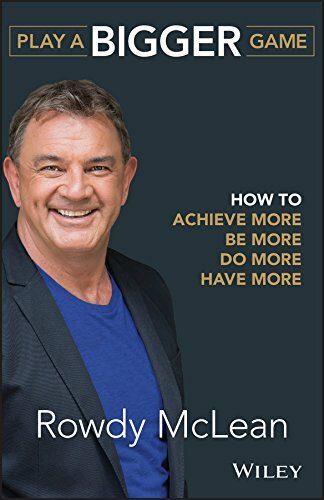 My friend Rowdy McLean, author of Play a Bigger Game, once did a year of saying no. I learnt so much around this idea watching him work and live without compromise. Compassionate, considerate, generous, and focussed on making sure he did the things that mattered most, not the things we often feel obliged to do. Interestingly, he had more time for people who would not normally ask for time and less for those he might not normally choose to help. The squeaky wheels did not get the most attention. My biggest counterpoint to this is to be very clear that you can't be efficient with relationships. If your old dad needs to spend 10 minutes or so talking through the exhaust problem on his 1962 converted trawler (hypothetically), then it's OK. It's not about the trawler, it's about his desire to be grounded in something real. In this case to bring back to life something honest and true rather than bob around on a show-off plastic mid-life crisis. It's about his desire to share that we should have a fix-it-up society, not the planned obsolescence mindset that's in most things today and leading to landfill. Don’t cut corners with the meaningful relationships in your life — they deserve genuine attention and time.